March is Frozen Food Month, so what better way to kick things off than with a meal straight from the freezer section? For years, battered and fried was the only way I enjoyed fish — whether from a favorite restaurant by the Connecticut shore or our favorite yellow raincoat-clad fisherman. While my tastes have changed over the years, frozen fish sticks still hold a special place in my heart. 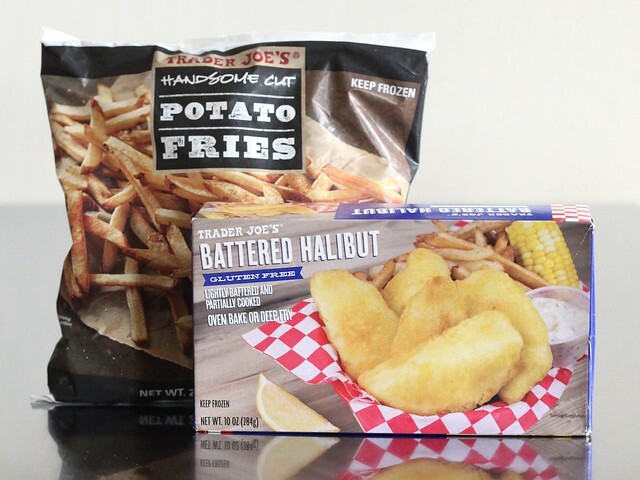 Happily, Trader Joe’s recently released a new product, gluten-free battered halibut, that I couldn’t wait to try. No minced fish here, a fillet of fish (not to be confused with the Filet-O-Fish) is enrobed with a light, crisp batter — delicious! Serve with a pile of handsome cut fries on the side, to make a complete, quick-and-easy meal that the whole family will enjoy. Let’s talk about our favorite nostalgia-filled foods in the comments or on Facebook or Twitter! Follow the instructions below or bake fish and fries according to package instructions. Arrange oven racks in the upper and lower thirds of the oven, preheat oven to 500°F. Line two large, rimmed sheet pans with parchment or nonstick aluminum foil. Divvy up fish and fries between the pans (you can commingle the fish and fries on the same sheet pan, just make sure the fish is in a single layer). Place pans in the oven and bake for about 10 minutes. Remove pans from oven, flip fish over and toss fries about. Place pans back in the oven on opposite racks from earlier, and bake for about 10 minutes more or until fish is hot and crispy (keep an eye on the fries to make sure they’re not over browning)! Serve immediately.